Contemporary life is so deeply reliant upon digital technology that the computer has come to dominate almost every aspect of our culture. What is the philosophical and spiritual significance of this dependence on electronic technology, both for our relationship to nature and for the future of humanity? And, what processes in human perception and awareness have produced the situation we find ourselves in? 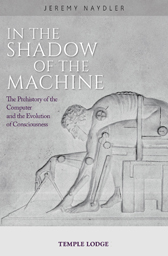 As Jeremy Naydler elucidates in this penetrating study, we cannot understand the emergence of the computer without seeing it within the wider context of the evolution of human consciousness, which has taken place over millennia. Modern consciousness, he shows, has evolved in conjunction with the development of machines and under their intensifying shadow. The computer was the product of a long historical development, culminating in the scientific revolution of the 17th century. It was during this period that the first mechanical calculators were invented and the project to create more complex ‘thinking machines’ began in earnest. But the seeds were sown many hundreds of years earlier, deep in antiquity. Naydler paints a vast panorama depicting human development and the emergence of electronic technology. His painstaking research illuminates an urgent question that concerns every living person today: What does it mean to be human and what, if anything, distinguishes us from machines? JEREMY NAYDLER, PH.D., holds a doctorate in theology and religious studies, and is a philosopher, cultural historian and gardener who lives and works in Oxford, England. He has long been interested in the history of consciousness and sees the study of past cultures – which were more open to the world of spirit than our own, predominantly secular, culture – as relevant both to understanding our situation today and to finding pathways into the future. His longstanding concern about the impact of electronic technologies on our inner life and on our relationship to nature has found expression in numerous articles contributed to magazines such as New View, Self and Society and Resurgence.